In my video for Stage 2 of Project 10 https://tigerctextiles.wordpress.com/2015/07/11/assignment-5-project-10-stage-2/ I showed how my idea for my final piece is evolving from the work of Marjorie Schick. This log entry is to look at some of Marjorie Schick’s work and to explain how I feel her work ties in to my theme of Ancient Egyptian Jewelery. Marjorie Schick was born in 1941 and has worked at the Department of Art at Pittsburgh State University for over 41 years. 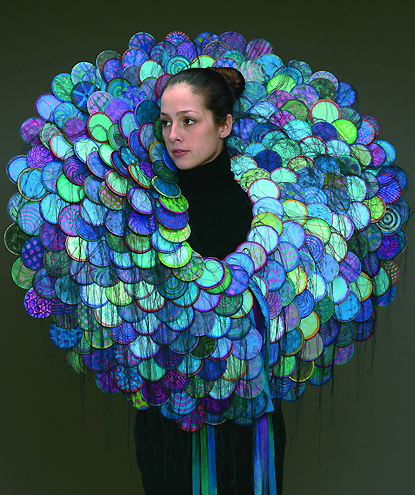 Her work blurs the boundaries between jewelery and sculpture so she most often calls it sculpture to wear and this is the title of her book Sculpture to Wear: The Jewelry of Marjorie Schick. Marjorie was herself inspired by the sculptures of David Smith (1906-1965 ) who has been described as “the sculptor who drew with metal”. 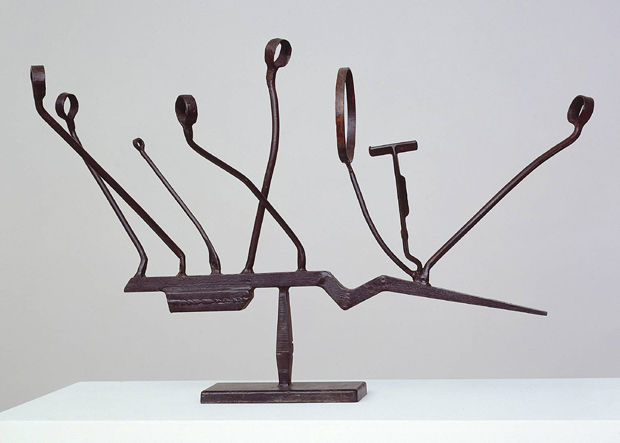 In an interview in 2004 Marjorie said about David Smith “And I, of course, love his work and – but I thought, ooh, how exciting it would be to be able to go put your arm through a hole or your head through a hole or whatever, so that was what helped inspire me to begin building body sculptures” (Marjorie Schick, 2004). 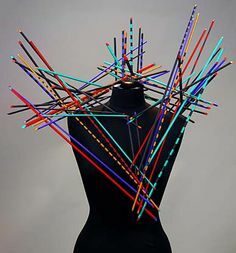 Marjorie’s work is made from a range of materials including painted wood and papier mache, often with metal supports which provide the structural elements for her pieces. 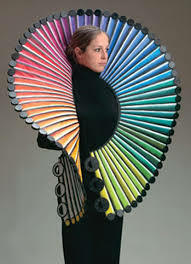 In an article by the Kansas State University, Marjorie Schicks work was described as “brilliantly colored and simultaneously tactile, ornamental, and performance-like”. It is these aspects of her sculptural pieces of jewelery that provide the link to my theme of Ancient Egyptian Jewelery. In my log entry of 6 June 2015 https://tigerctextiles.wordpress.com/2015/06/06/theme-book-progress/ I created mood boards based on Composition, Form, Texture, Colour and Materials. 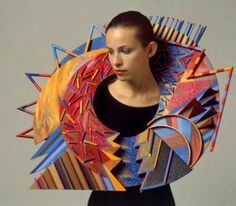 When I produced the board on Form I used the words “chunky, bold, rounded, raised and exaggerated” to describe the forms of the jewelery and these terms equally apply to the works of Marjorie Schick. Egyptian Jewelery was also very colourful, with lots of red, turquoise, green, dark blue set against the usage of lots of heavy gold. Some of the jewelery I have looked at has been more delicate but the majority have been dramatic pieces worn by royalty as statements of their power and wealth. The large pectorals were heavy and needed counterbalacing weights at the back to hold them in place. 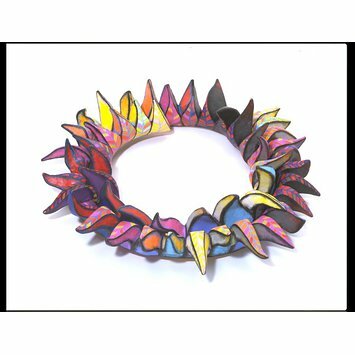 These similarities of form, colour and drama between the modern jewelery of Marjorie Schick and the ancient Egyptian jewelery of the pharoahs has led me to my design idea to produce a piece of sculpture to wear influenced by the work I have done in my theme book.